Iowa City, Iowa: Naughty Dog Press, 2018. Edition of 30. 9 x 10" gate fold. Letterpress printed during a one-month stint as printer in residence at the Old Bodleian Library, Oxford, England. Printed using hand-set Bell type, linoleum blocks, and P22 Blox on Mohawk Superfine. 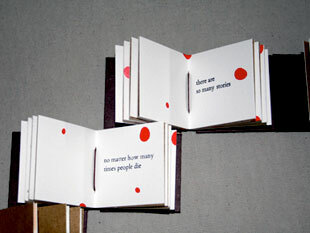 Pamphlet sewn on both spines. Bound with a duplexed Bugra paper cover. Signed and numbered by the artist. Emily Martin: "The germ of this project was the stage direction from Shakespeare's The Winter's Tale, Act III: Exit, pursued by a bear. This stage direction contains both the terror signified by this wild creature and the comic nature of its unexpected arrival and exit. The single direction was expanded to include a set of ten performers entering and exiting to various stage directions, including the front and back halves of a bear. The format of the book allows the viewer to control the order and tempo of the performers' arrivals and departures from the stage." Iowa City, Iowa: Naughty Dog Press, 2016. Edition of 25. 12 x 10 x 1" dos-a-dos structure. Laid in black Japanese linen cloth clamshell box with titles on the spine. Signed and numbered by the artist on the colophon of both books. Funny Peculiar: 19 pages. Letterpress printed on an SP15 Vandercook proof press using handset type and P22 Blox combined with rubbings, ink washes, and collagraphs. Printed on Domestic Etch paper with gray Pescia endsheets. Drum leaf binding. 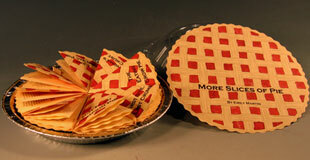 Funny Ha Ha: 28 pages including 9 leaves in slice structure. Printed on an SP15 Vandercook proof press using handset type combined with relief printing using P22 Blox, collagraphs, and polymer plates from Box Car Press. Printed on white Pescia paper with gray Pescia endsheets. Slice book structure. Emily Martin: "Funny Ha Ha Funny Peculiar or Funny Peculiar Funny Ha Ha is the result of my extended study of Shakespeare's comedies. I find the comedies individually to be enjoyable but there is a sameness to many of the plots that allows me to mix them up in my head. So much mistaken identity, gender confusion, and various other contrivances while romping their way to a fifth act wedding or two. Even more problematic are the decidedly unfunny themes that are common in many of these same comedies such as hypocrisy, sexual harassment, intolerance, sexism, misogyny, and anti-Semitism. "I struggled for a long time to integrate all these ideas. I finally realized that what I needed to do was to address each aspect separately, thus a dos-a-do book. Each side has its own focus and treatment. The characters are the same in both books. They are printed using the P22 Blox which are a set of modular shapes that can be interchanged to change the body's posture and gestures. The P22 Blox allows the presentation of the characters as interchangeable as well. "Funny Peculiar is a drum leaf book and presents selected lines from five plays delivered by characters on a stage set. Funny Ha Ha is a slice book allowing the viewer to mix and match the costumes and gender of the characters in a variety of postures." Iowa City, Iowa: Naughty Dog Press, 2000. Limited Edition. 5.5 x 8.5"; 36 pages. Black-and-white xerox slice book [slice book is Martin's own coinage, see below] with text and images. 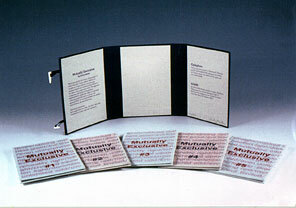 Card stock with a black plastic comb binding. A book from Martin's "Eyes Were Watching" series. 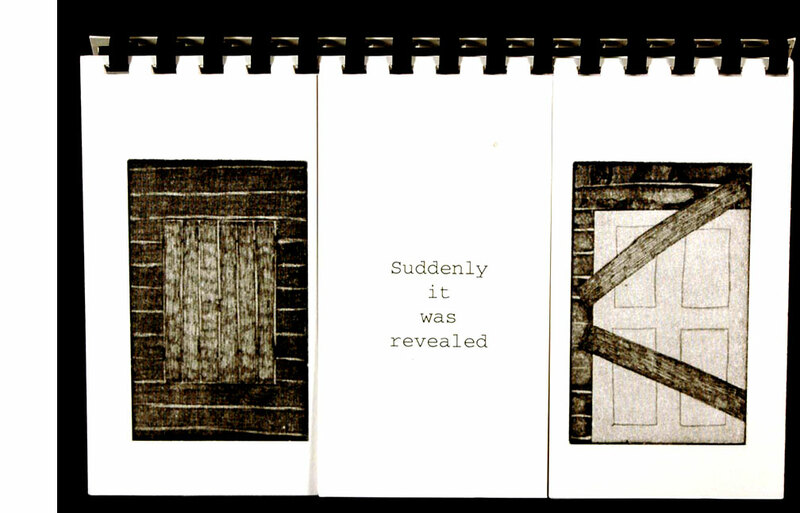 Each page is divided into thirds; each third holds an image or a connecting phrase (for example, "Suddenly it was revealed," "Later that same day"); images and phrases can be sequenced in a mix-and-match mode, giving multiple combinations and viewing scenarios. Much like an exquisite corpse structure. Martin:"I somewhat arbitrarily called them slice books, I think the form predated the Exquisite Corpse games, which did combine images but on intact pieces of paper." Iowa City, Iowa: Naughty Dog Press, 2015. Edition of 10 + 2 proofs. 19 x 13" cloth-covered clamshell box containing 6 portfolios with single sheets laid in plus two single leaves for title page and colophon. Handset type letterpress printed and additional printing using assorted foams and adhesive plates, wire, pressure printing, and collographs. Interior illustration sheets printed on Sakamoto lightweight paper. Title, colophon, folder papers are Arches Text Wove paper. End sheets are duplexed Bugra paper. Numbered and signed on the colophon by the artist. Emily Martin: "Since 2011, I have been working with Shakespeare’s tragedies, reading and rereading the plays, distilling the themes. In this book I was exploring Othello with a particular interest in Desdemona and her appalling passivity. I extracted her dialog into individual words made into magnets and rearranged them to give her new lines to speak up for herself." Emily Martin, colophon: "To this modern reader Desdemona is dismayingly passive. I isolated her lines and made a set of individual word magnets so I could arrange and rearrange her words to see what else she might say. While I cannot make her say some of the things I wish she would, I found that in the time I have spent with her words I developed a greater appreciation for the language of the play. The result is this very short play consisting of a prologue, five acts and a coda. Some of the lines are addressed specifically to Othello, Iago, or the supporting characters Emilia, Cassio, and Brabantio, who I have taken to thinking of as a combined chorus figure and two lines are addressed to the worlds at large. This book is the second of a series of works using my re-ordered lines for Desdemona. " Iowa City, Iowa: Naughty Dog Press, 2006 - 2007. 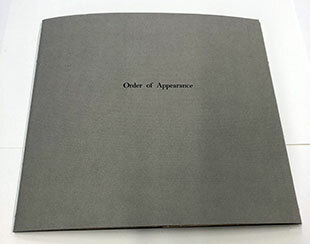 7.6 x 10.75" cloth-covered box containing five letterpress printed flexagons. 1) Inside Out or Denial is a Wonderful Thing: 6" square; continuous flexagon printed in two colors on Mohawk Superfine paper, enclosed in a folder with complete operating instructions. 2) Mid-Coastal: 5 x 10" tetraflexagon printed in two colors on French's cement-colored construction paper enclosed with an instruction card in a plastic sleeve. 3) Nice vs. Polite: 6 x 4" woven flexagon printed in two colors on Mohawk Superfine paper and enclosed in a plastic sleeve. 4) A Game of Fetch: 6 x 6" hexaflexagon printed in two colors on Mohawk Superfine paper and enclosed with an instruction panel in a plastic sleeve. 5) Where Ever You Go There You Are: 5 x 5" rotating ring format printed in three colors on slate blue construction paper from the French Paper Company and enclosed in a plastic sleeve with a paper wrapper containing the operating instructions and colophon. Emily Martin: "This series was started with an idea of the formats but no specific plan regarding the content. As it turns out the series functions as an odd sort of chronicle of the last two years." 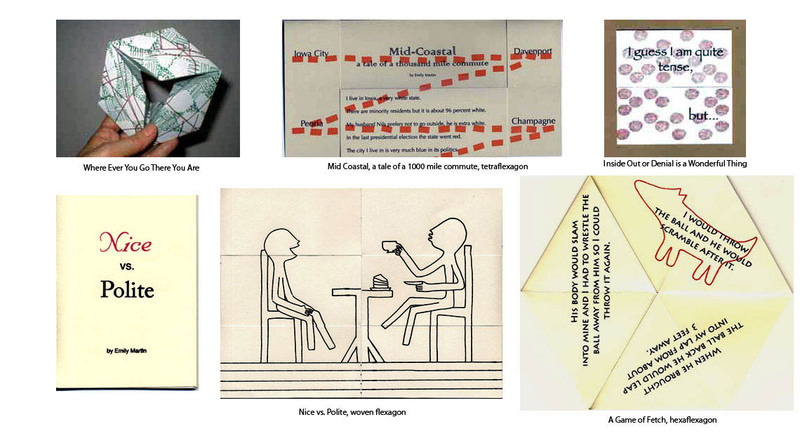 A pamphlet included in the set gives context to the events chronicled in each flexagon: long-distance relationships, commutes, inner dialogue, the death of a beloved dog and the end of a relationship, the power of friendship. Iowa City, Iowa: 1996. Limited Edition. 8.5 x 5"; 12 pages. 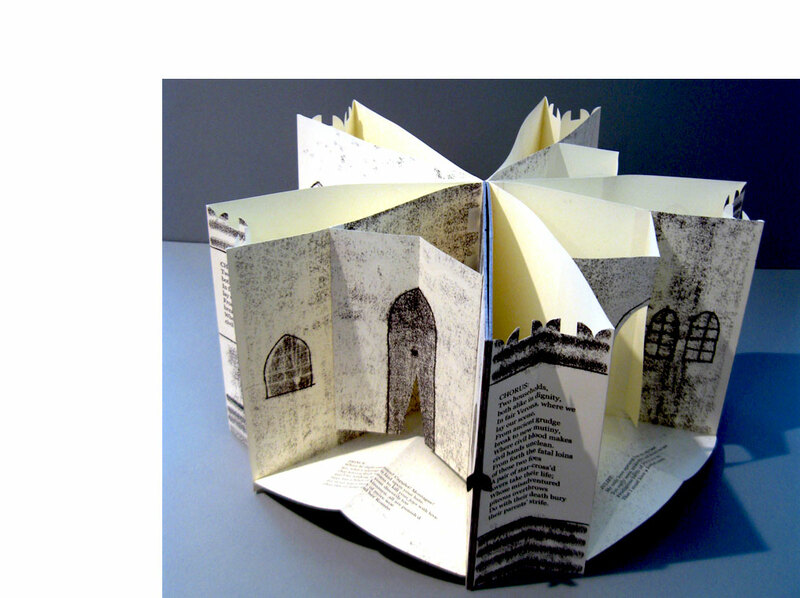 Pop-up accordion book. Computer printed on commercial papers. 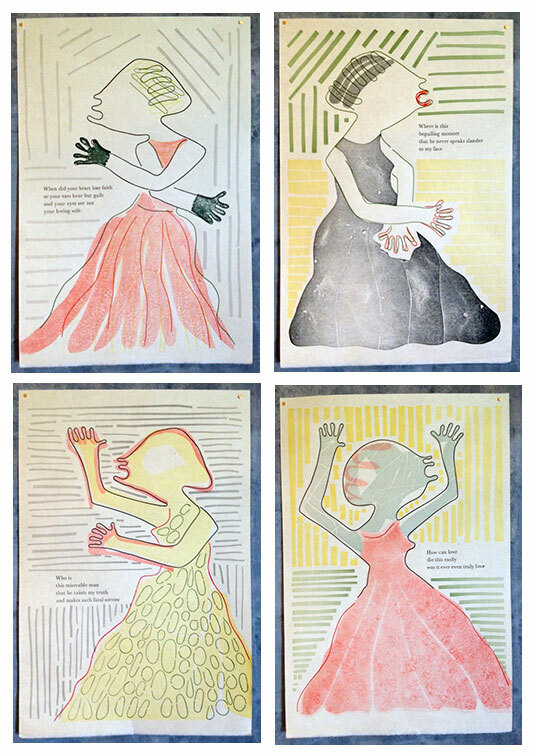 An event from childhood told from three points of view – that of the mother, the victim (Emily), and the sister (Carol) – set off by page placement and different colors of ink. The simplicity of the presentation is high contrast to the emotions and pain recounted. Iowa City, Iowa: Naughty Dog Press, 2008. Edition of 25. 9" diameter; 8 wedge shaped books. Inkjet printed on ivory 20 lb. text paper and cream Canson paper. Trimmed with wavy scissors. Typefaces: Century Gothic and Copperplate Gothic Bold. Wedges laid into aluminum pie pan, which is housed in clear plastic pie container with snap-on lid. 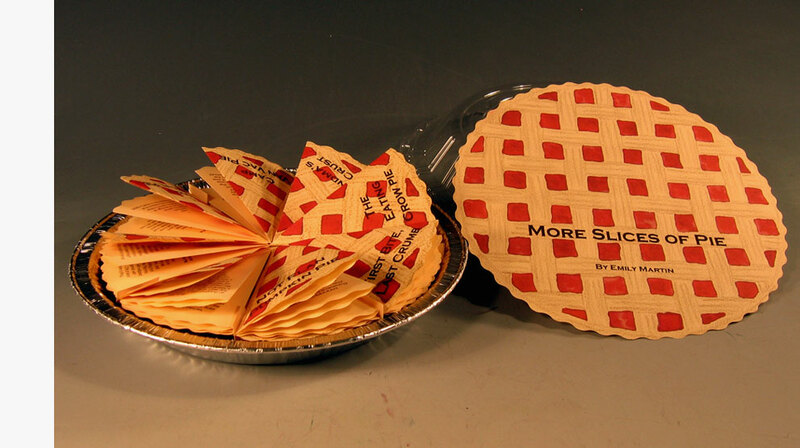 This bookwork is based upon an earlier work Eight Slices of Pie (2002). Eight slices of comfort food containing family stories, bits of advice, and recipes: "First bite, last crumb" (introduction and colophon); "The eating crow pie" (Pie Shake); "Grandma's pie crust" (Recipe); "Me, Martha & pie in the city" (Peach Pie); "Todd's special pie" (Banana pie); "Not flan pumpkin pie" (Pumpkin Pie); "Heaven on earth pie" (Chocolate Ambrosia Pie); and, "Camp Van Vac pie" (Wild Blueberry Pie). Iowa City, Iowa: Naughty Dog Press, 2002. Edition of 50. A letterpress printed set of 5 magic wallets provoked by the events of 9/11 which address the cacophony of news reports, emotions analysis and opinions (expert and otherwise) that follow in the wake of any major news event. The righteous indignation and reciprocal intolerance, whitewashed by ideals from religion to political correctness, raise the question of personal belief. 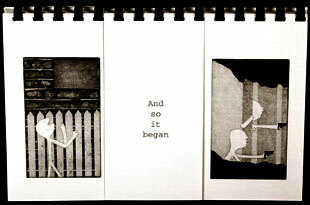 Using the magic wallet format, the books panels flip back and forth forming two opposing statements that reflect the slipperiness of forging a personal philosophy. 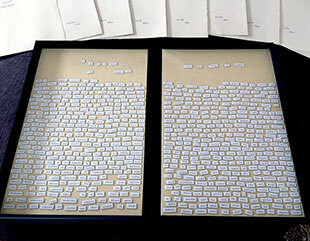 Each of the texts has three layers, the pairs of basic statements in large type and the 10 sets of words from the Pythagorean table of opposites printed in transparent ink. The wallets are contained in a Japanese box wrapper with bone clasps made by Rosa Guimarae. 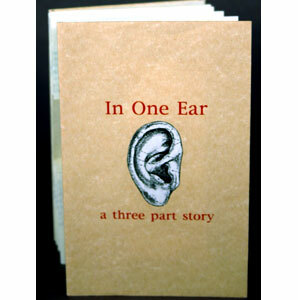 Printed with the assistance of interns during an artist's in residency at the Center for the Book Arts in New York City. Each Wallet is 6 inches by 4 inches. Iowa City, Iowa: Naughty Dog Press, 2011. Edition of 20. 2" x 2" x 8"; 268 pages. Letterpress printed on Rives BFK paper and stained with acrylic paint. 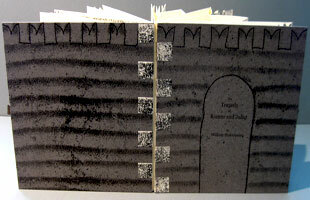 Bound in covers made with moriki and University of Iowa flax paper. 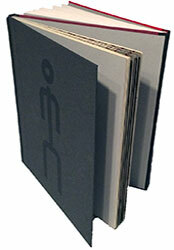 Each individual book is hinged together with walnut crackle paper from Cave paper. 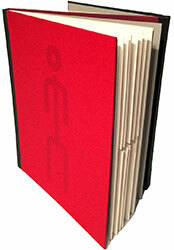 Comprised of 10 linked Coptic-bound books with one line of the text in each of the books. Housed in cream linen box with elastic closure. Not a Straight Line commemorates the burning of the ancient booksellers' street in Baghdad in March 2007. It was created as part of the Al-Mutanabbi Street Project, which was "A Call to Action for Letterpress Printers! To protest & commemorate the bombing of al-Mutanabbi Street, the centre of bookselling in Baghdad, on March 5th 2007." The project aims to re-assemble some of the inventory of the reading material that was lost in the car bombing of al-Mutanabbi Street.One complete set of the books from this project will be donated to the Iraq National Library in Baghdad. To read Not a Straight Line viewers must find their way along the linked books that turn this way and that, much as a meandering street would. Iowa City, Iowa: Naughty Dog Press, 2012. Edition of 9 + 1 AP. 10.75 x 10.75 x 1"; 20 pages. Carousel structure. The text was letterpress printed onto Mohawk Superfine 100 lb Text paper. The images were made with an ink transfer monoprinting technique. The covers are printed on a handmade flax, abaca, and linen paper from papermaker Mary Hark. 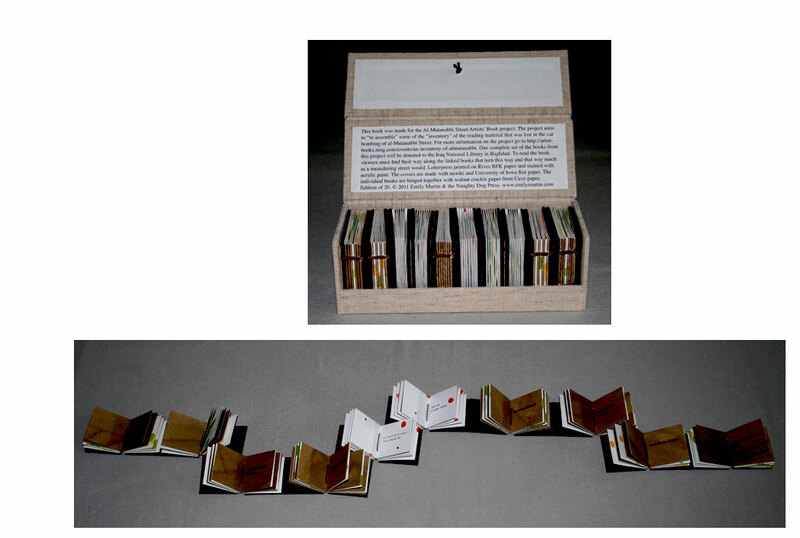 The book is enclosed in a clamshell box covered with Japanese book cloth with title on spine. Emily Martin, Colophon: "I made this book in response to the call for entries from the Bodleian Libraries and Designer Bookbinders for an international designer bookbinding competition in 2013. I have never made a designer bookbinding and I didn’t intend to start now but I entered this competition based on two things. First I heard Richard Ovenden speak at the 2011 Codex meeting and he emphasized that they wanted artists’ books for this competition. And second there was a pop-up in the call publication. "I selected the excerpts after reading the play a number of times, one line of dialogue to represent the story being told in each of the five acts. I had not remembered the chorus from previous readings and I have chosen to emphasize the timelessness of the play through repetition of the chorus and insertion of modern equivalents for Verona. I have also added a commentary of my own beneath the repeated chorus. "This carousel book uses a format that I devised to allow for scenes and separate text panels. The spine tabbing, also of my devising, functions both to hold the book together and to balance the thickness at the fore-edge."